When looking for publicity for your business, product or event, nothing gets the word out faster than a PRWeb press release. If you're not familiar with writing a press release, no worries, PRWeb has all the tools to guide you through the process of writing a professional and informative press release that can help attract new customers, establish online visibility, and let the world know about your latest news. With an easy-to-use template and step-by-step instructions from PRWeb, a successful press release is just moments away from being distributed to top news sites, search engines and journalists around the world. PRWeb has outstanding features that allow you to create the best possible press release without having to be an expert in search engine optimization (SEO) or an Internet marketing guru. The interactive press release site provides all of the tools needed to design your release to get the most media attention possible. PRWeb will help you determine the best marketing strategy for your release and direct you on how to add key words, embedded videos, photos, links, and more to help set you apart from the competition and get your company the attention it deserves. PRWeb allows the user to create a free account to create a press release and provides everything needed to get you started. Simply use the free online tutorials and browse sample press releases to help choose the desired format for the release. Next, select the PRWeb press release package that works best for your organization by choosing to add video, distribution options, SEO-focused wording, and more. Now, you are ready to enter your release into the press release template to submit it to PRWeb's team of editors for release to their worldwide distribution network. It's that simple! Once the press release is created, PRWeb will distribute your company's news so that you will have an online presence that will attract media and potential customers to your company. You can choose the press release package that best suits your needs and target audience through optimization in major online search engines or even having your release sent directly to a network of over 30,000 professional journalists and industry leaders who may have interest in your company. In addition, your company's press release will be assigned a unique web address that will assist in improving your online presence by utilizing keywords that best describe your business or product. There is simply no easier or better way of securing press coverage and media attention than releasing a press release with PRWeb. With over 82 million PRWeb headline views each month, 250,000 news subscribers and 30,000 opt-in journalists, your company can gain the recognition of top media outlets such as the Associated Press and the New York Times! From your hometown newspaper to local and world wide business and trades press, PRWeb helps you create and attract new customers and build your company or brand with a professional press release in a few simple steps. 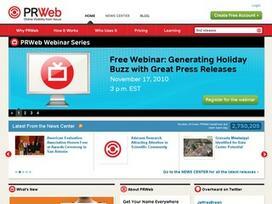 Share what you think about PRWeb, and your favorite ways to save there!